Back for his third season, the BIC’s resident Irishman grew up on the coast in both Dublin and the South of Ireland. Alex has just graduated from University College Dublin in Law and Economics. Alex is a qualified senior instructor, the highest certification in Ireland. 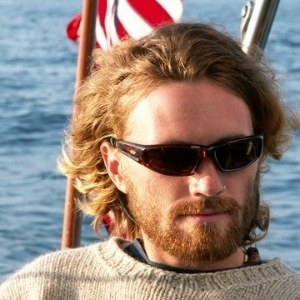 Alex has taught in some of the top sailing schools in Ireland and the UK. Despite the many avenues in sailing, Alex’s passion has always been teaching and finding new and effective ways of instructing. Alex’s favourite part of the BIC are the members, who make it so unique and special. In his spare time, Alex trains in jiujitsu and plays guitar. Growing up between City Island, NY, and Block Island, RI, Cameron has continued his family's tradition of grace under sail. Cameron has delivered sail and power yachts throughout the world; he's taught sailing, and skippered his family's own fleet of racing one designs from Finn class dinghies to IC canoes. Also collegiate sailor, Cameron skippered and competed in the 2006 Flying Dutchman North Americans. Cameron has a gift for sharing his love of the ocean. He has innovated techniques for youth as well as adult education for several Rhode Island sailing schools, including Block Island Maritime Institute and Providence Community Sailing. He has also taught on set for film talent and performed stunts for film. Cameron is also a classically trained musician, and runs a music festival on Block Island conceived to raise funds for land conservation. Somehow he also finds time to lead a jazz ensemble, travel, surf, and cook vegetarian food. Katie is from Duxbury, MA, where she attended Duxbury High School. This fall, she will be a sophomore at the College of the Holy Cross, where she runs track and cross country. She has been coming to Block Island every summer since she was 2 months old and is a third generation member of the Block Island Club. She has worked at BIC for the past four years, first as an intern, and then as Arts & Crafts Instructor. One of her favorite BIC memories is walking with the float in the annual Fourth of July parade. She is excited to be returning this summer to work in the office and more importantly as ‘Xtreme Sports Coordinator’!! John is from Scarsdale, NY. He is a rising sophomore at Bowdoin College where he competes on the sailing team. His favorite BIC memory was the 420 class scavenger hunt. John looks forward to teaching a variety of classes and abilities, as well as building enthusiasm among the kids. John is US Sailing Level 1 certified. Jillian is from Barrington, RI, and has been going to the BIC ever since she was young. Jillian is currently a freshman at Catholic University and is an Early Childhood Education major. Her favorite part about Catholic University is being apart of the Track & Field team. This will be Jillian’s third year as a Sailing instructor at the BIC. She is excited to see new and familiar faces on the water this year! Her favorite BIC memory from when she was a kid was Pirate Day! She can’t wait for another great summer and to see everyone again. Jillian is US Sailing Level 1 certified. Chris Elwell is from New York City, the greatest city in the world, and graduated from the St. George School in Newport. He is going to Notre Dame next year. He has been a member of the Block Island Club since he was seven years old. He has sailed on his high school team for four years, and at the BIC since he was eight. This will be Chris’s second summer as an instructor at the BIC. Emily grew up in Haverford, Pennsylvania and attended The Episcopal Academy for high school. She will be entering her junior year at Middlebury College in Vermont. Emily began going to the Block Island Club when I was five years old and could not wait to become an instructor when she got older. This will be Emily’s fourth year as a tennis instructor. Her favorite memory from the Block Island Club is the first time I got to play in the tennis tournament when she was ten. It was her first time playing competitively with friends and it was filled with lots of laughs and great tennis. Emily is so excited for another summer of pizza tennis nights, dock dining, and of course the water barbeque! Abigail is from Barrington, RI, and will be attending Catholic University this fall. She has played for the Barrington High School varsity tennis team for 4 years and won 2nd place doubles team in the RI State Championship this past fall with her twin sister Jillian. She has worked at the BIC for 4 summers: first as an intern then as an instructor. She looks forward to another fun summer with the kids! Julia is a senior in high school and will be attending the University of New Hampshire in the fall. She is from Norwalk, CT and has been going to Block Island with her family since she was born. This year will be her second year at the Block Island Club as an arts and crafts instructor. She has been coming to Block Island since she was a kid. Bryanna’s favourite BIC memory is fun friday's in sailing. She is really looking forward to having the teaching swimming for the first time at the BIC this year! Sarah is from Westport, CT and attends Miss Porter's School. Her favourite BIC memory was sailing with the instructors for Thursday Night Racing. They called themselves the feather-heads because I had little feathers in my hair (they were super popular at the time!). Sarah is really looking forward to meeting everybody at the club this summer!